Wet weather is expected to come in during the first part of the week and linger around for most of it. 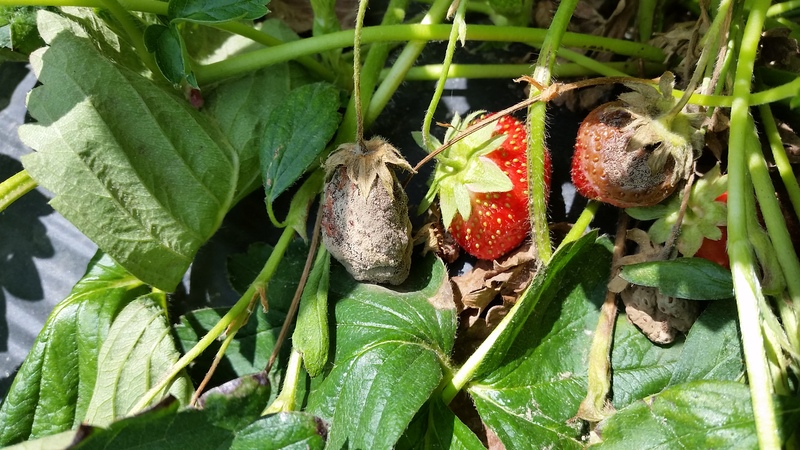 Now that strawberries are in full production growers need to pay close attention to fruit rots such as anthracnose and botrytis. Overipe or unharvested mature berries left in commercial or u-pick fields can act as sources of inoculum for both pathogens. Importantly, both pathogens can develop and spread rapidly under wet, rainy conditions and the appropriate protectant fungicides need to be applied ahead of any inclement weather. Botrytis, or grey mold, on mature strawberry fruit. Botrytis can develop and spread rapidly under cool, wet conditions. Anthracnose fruit rot can cause serious losses if not controlled properly. Symptoms of anthracnose include the development of circular, sunken lesions on infect fruit. Often pinkish/tan colored spore masses will develop in the center of lesions. 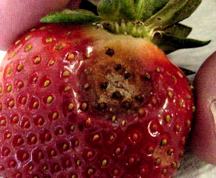 Anthracnose in strawberry is caused by Colletotrichum acutatum. Spore production, germination and fruit infection are favored by warm, humid weather. The fungus can overwinter on infected plants, in plant debris or on weed hosts. Spores are dispersed by splashing water and can infect green and mature fruit. Anthracnose fruit rot of strawberry. Gray mold is often a serious problem during extended cool, wet periods when fruit are sizing and reaching maturity. Symptoms of gray mold are the diagnostic grey, fuzzy growth that will cover entire fruit. Control of gray mold, like the other diseases, begins with recognizing the conditions for its development, its symptoms, and preventative fungicide applications. Start sprays when plants begin to bloom, because 90% of fruit infections occur through the flower, and repeat every 7-10 days. Increase spray intervals during persistent dry periods, but decrease intervals to 5-7 days during very wet periods. Four weekly sprays starting at 5-10% bloom are usually sufficient for season-long control. Tank-mix and rotate fungicides from different FRAC codes to reduce the chances for fungicide resistance development. Growers need to pay close attention to weed control and keep weeds to a bare minimum within- and in-between rows. Weeds will help create micro-environments that will help trap humidity in the canopy favoring botrytis development. Use a thick layer of mulch in matted row or plastic production to prevent anthracnose spores from being splashed onto the canopy. Avoid overhead irrigation at all costs. Organic materials may offer some suppression of both diseases and will need to be applied regularly. All anthracnose and botrytis-infected fruit should be removed from field.